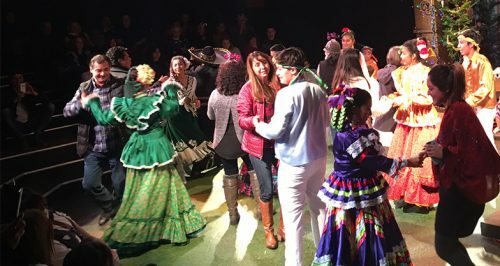 On Sunday, Milagro Theatre will celebrate one of the city’s most congenial holiday gatherings, its 14th annual Posada Milagro, an all-ages immersive experience of Latin American traditions for La Navidad. The “Miracle Inn” portrays the journey or Pastorela of Mary and Joseph as they search for shelter and await the birth of baby Jesus. Posada Milagro will include two performances of the Pastorela, at 2 and 4 p.m. Sunday. Papalotl Ballet, Portland’s own multigenerational ballet folklorico de Mexico, will perform its whirling and toe-tapping repertoire of dance, backed by music from Cosecha Mestiza. After each performance there’ll be a chance to take a swing at a piñata. Latinx Improv will entertain the crowd with their comic storytelling. The afternoon will include hands-on activites, too: adults and children have five handicrafts to choose from, including ornament-making. Traditional tamales and hot chocolate will be available to buy from Tortillería y Tienda de Leon. Even better, you can bring a donation for the Oregon Food Bank and help support families in our community. This year’s Posada will feature a photo booth, too. Put on your best or ugliest Christmas sweater to get the picture done right! Admission to Posada Milagro is free. However, the Pastorela is limited to ticket-holders only. Free tickets will be distributed on a first-come, first served basis at the theater beginning at 1 p.m. on the day of the event. For one day only, this family-friendly event is on Sunday, December 18th from 1 PM to 5 p.m. at El Centro Milagro, 537 S.E. Stark St., Portland.